Ceil Wheeler and Callaway’s Brioni. Photo courtesy of Shiflet Photography. Lexington, VA – June 28, 2017 – The Roanoke Shenandoah Valley Horse Show returned to the Virginia Horse Center on Wednesday, June 21, for the second year in a row. Exhibitors took to the Coliseum ring to compete for top honors, with championship pinning taking place throughout the weekend. The Roanoke Shenandoah Valley Horse Show, previously held at the Salem Civic Center, was hosted by the Virginia Horse Center in 2016, and now in 2017 continued as a new event under new manager R. H. Bennett. The show began in 1972, and was been granted United States Equestrian Federation designation as a USEF Heritage Competition. The designation is only given to those competitions that have made substantial contributions toward the development of the sport, promote and practice equestrian ideals of sportsmanship, and have been established for a long period of time. During this year’s competition, Ceil Wheeler and her own Callaway’s Brioni took home the tricolor in the ASB Ladies Five Gaited Championship. The reserve champion was presented to Phyllis Brookshire aboard Man on the Move for the class. Suzanne Wright and Fort Chiswell’s Wild Kiss earned the ASB Five Gaited Show Pleasure Adult championship, with the reserve championship going to Jennie Garlington riding Kalarama’s New Moon. In the Hackney Pony Pleasure Adult Championship, it was Toni Nastali aboard Sandra Surber’s Heartland Resplendent that received the tricolor. The reserve champion in the Hackney division went Patty Hylton riding her own, Crystal Creek’s Legacy. The win in the ASB Fine Harness Jackpot went to Larry Hodge aboard Trust My Imagination, owned by Hillcroft Farm. Hodge also took home the win in the ASB Five Gaited Jackpot, this time aboard Two Sweet to Kiss. The ASB Five Gaited Jackpot was dedicated to Matt Shiflet’s grandfather, Claude Shiflet, a trainer whose family has been coming to the Roanoke Valley Horse Show from the beginning. The Shiflet family was honored before the class. For more information about the Roanoke Shenandoah Valley Horse Show and the Virginia Horse Center, please visit www.horsecenter.org. Lexington, KY – The nation’s top saddle seat riders will compete in the 2012 U.S. Saddle Seat World Cup Team Selection Trials held at William Woods University in Fulton, Missouri on March 31, 2012 in hopes of earning a spot on the 2012 U.S. Saddle Seat World Cup Team. 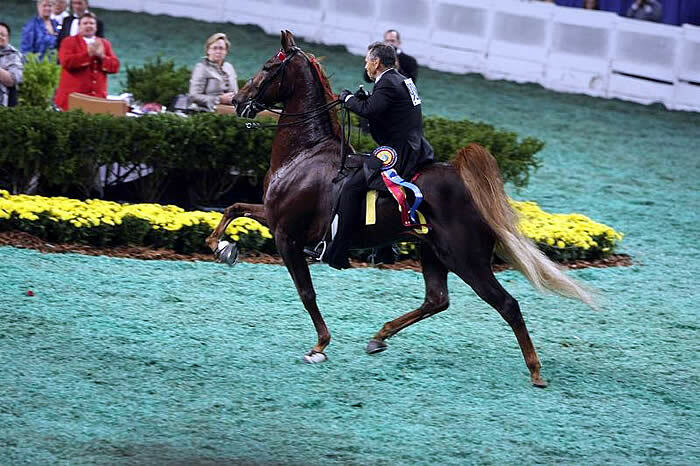 The Saddle Seat World Cup consists of a three-gaited and a five-gaited competition. At these Trials five team members and one alternate will be selected for each team. Athletes selected will represent the United States in December’s International Saddle Seat World Cup competition in South Africa. The Saddle Seat World Cup is a bi-annual international competition that originated in the early 1980s as an informal exchange of saddle seat riders between the United States and South Africa. Teams from as many as five nations now compete for coveted World Cup titles.